When knitting top-down, seamless sweaters, there comes a point when you need to take your sleeve stitches off onto a holder. Safety-pin type stitch holders don’t work for this. Scrap yarn works, but tends to slip up into the stitches, making the job of getting each stitch back onto a needle laborious. You can leave them on a spare circular needle or cord – but it’s challenging to have needles and cord hanging everywhere. I found that a leather cord had the flexibility of yarn, but was firm enough to keep the stitches from disappearing up into themselves. 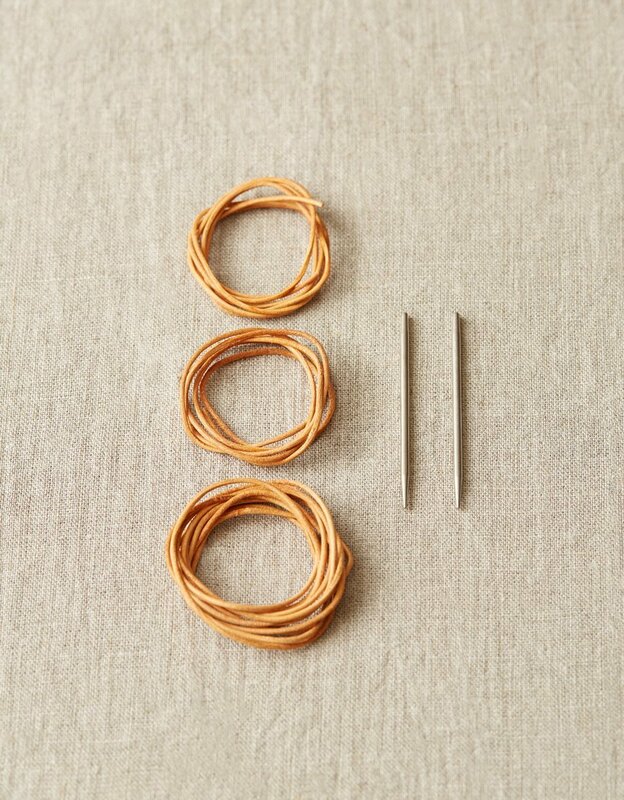 The interior-threaded needle means you can knit onto and off of the cord – like a leather circular needle. The needles screw onto, and off of, the leather cord.